The town-owned conservation areas within the Town of Skaneateles. Map update at the Guppy Falls parking lot kiosk. Federal Farm and associated areas on Old Seneca Turnpike and Gully Roads. Federal Farm and Gully Road properties with terrain and elevations shown. Timber stands described in the 2000 Forest Stewardship plan drawn up by DEC forester Charles K. Porter. The Federal Farm and Gully Road areas. Satelite view of Federal Farm and adjacent areas. Mabel M. Reynolds Nature Preserve topographic map (USGS-ESRI). 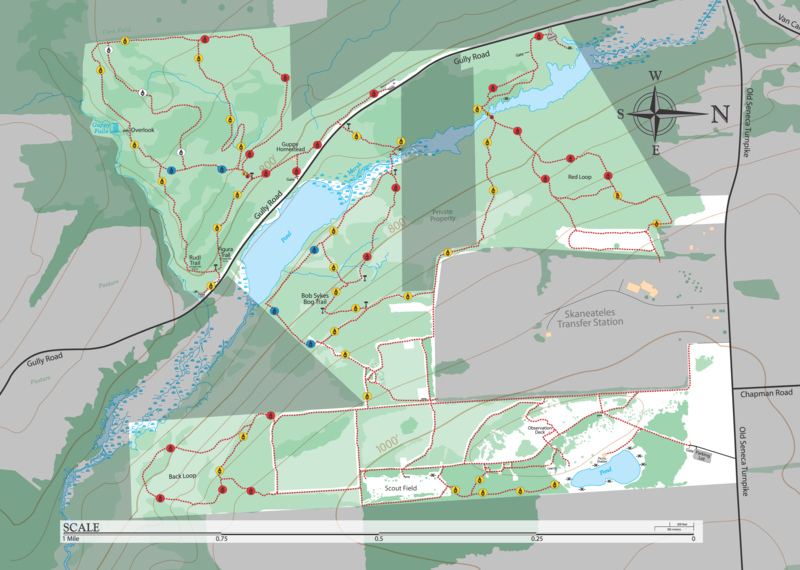 Mabel M. Reynolds Nature Preserve countour map with tree types listed. Dunning tract with wetlands indicated.